Hey Teachers! Looking for some good online resources to talk about Indigenous food, health, culture and the environment with your class? The links below give you some places to get started. Share how you have used these sites and ideas here and put up new places for your fellow teachers to check out and use! Want to show a digital story to your class as part of your curriculum? Use the English or French transcripts to catch every word and Get Taking discussion suggestions provided as PDF downloads with select stories. Damon discusses the life of his papa, who was born in Finland who is a very instrumental person in Damon's life. Damon's Papa formed a strong connection to the land, even though he is not indigenous to the land. He traps, fishes, hunts and knows how to use traditional medicines and teaches his grandchildren the ways of the land and culture. James speaks of the Victoria Native Friendship Centre and its importance for bringing a sense of community to urban indigenous youth. The center involves the youth in a community garden as well as connects with the youth through traditional foods. James believes that traditional food is medicine and his people require it for their well-being. He discusses the negative health effects as a result of consumption of non-traditional foods and how his people need to return to the ways of his elders. 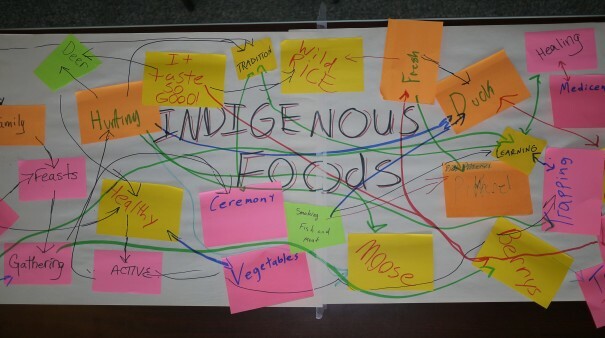 Over the course of a few days throughout a youth and elder digital harvesting workshop, attendees were provided an array of traditional and non-traditional foods. The youth noticed the difference in energy levels when traditional foods were consumed, as opposed to non-traditional foods. Youth were more energetic when traditional foods were consumed. See through the eyes of a three year old boy out fishing for crabs and oysters with his Papa and his Daddy. He tells the story of how the fishing trip went and how he returned home to share the food with his siblings. Waylon tells a story of harvesting the plant, "Stinging Nettle" with his family. He speaks about the uses of nettle as a rope, tea, edible source, and remedy for arthritis. He discusses the history, threats to, and uses of the plant and emphasizes its importance to his people. Leonita speaks about the importance of traditional foods, identifies core traditional foods from her people, and how food in general as a way to connect with people. She was taught that you should always cook with good feelings because it reflects in your cooking. Two youth, Christoper Smith and Brittany Gillette (Kyuquot First Nation) interview elder Betty Nicholye on the historic availability of traditional foods, the causes of traditional food shortage over time, and how these causes make the traditional food inaccessible and the impacts on culture are discussed.